Why Become a NAALT member? Membership in NAALT offers important benefits and opportunities to researchers, practitioners and students engaged with all aspects of therapeutic light therapy in North America (Mexico, USA and Canada). Applying online is easy and we welcome your participation! 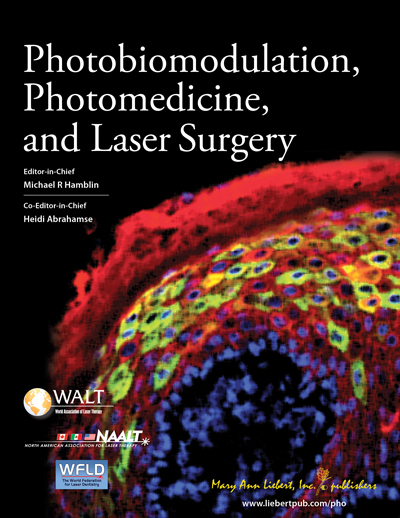 A full annual membership includes online access to Photobiomodulation, Photomedicine, and Laser Surgery, the journal delivering cutting-edge, peer-reviewed advances in phototherapy, low-level laser therapy (LLLT), photobiomodulation, laser surgery and surgery for over 35 years. NAALT members have access to current volume and complete archive of peer-reviewed content. Visit the journal website for comprehensive information, author instructions, and to read a sample issue. * Society members in good standing will be eligible for one PHO submission fee waiver per year providing they can show documentation of their membership.